What a feast for the eyes and ears! Four choral groups performed before us in the beautiful acoustics of Elder Hall. Looking pretty sharp, St. John’s Grammar from Belair opened the show with a captivating selection, including a ‘clear as a bell’ rendition of Simon & Garfunkels’ Bridge over Troubled Water. Beautiful. Brighton High Schools’ Touring Choir set was well rehearsed, with the stand-out performance of an original arrangement by one of their own students of Coldplay’s Midnight. There was a wave of resounding clapping the Women With Latitude bounced on stage bringing their joy and absolute delight in community singing. This 30-strong a Cappella voice ensemble are joyous and fun, and we almost want to sing along to Mr Sandman (The Chordettes) and Bohemian Rhapsody (Queen). Dressed in black and individually accessorised with flashes of red in their jewellery, scarves or shoes, they enjoy their womanliness. The sassiness of the women is then counterpointed by the arrival of the Spooky Men Of The West as they saunter slowly on to the stage in their dark outfits, various hats and beards. ; this bunch of blokes revel in their masculinity. Though not a Men’s group, they make sure we know they are men, that they are there and we notice them – ‘Yes’ – we see, hear and smell you! Ahhhmen. They love to sing about concrete, practice mysterious handshakes and are masters at ‘mastodontotry’ and ‘manhommery’. The lyrics are ironic (Don’t stand between a man and his tool), and accompanied by some very well executed comic theatre. Mostly originals, they do the occasional cover (Teddy Bears Picnic) but of course have to have a Spooky Men of The West twist! Thoroughly entertaining, this show is a winner. Spooky Men Of The West And Women With Latitude continues at various venues until Sun Mar 1. Elder Hall, Sat Feb 28 What a feast for the eyes and ears! Four choral groups performed before us in the beautiful acoustics of Elder Hall. Looking pretty sharp, St. John’s Grammar from Belair opened the show with a captivating selection, including a ‘clear as a bell’ rendition of Simon & Garfunkels’ Bridge over Troubled Water. Beautiful. Brighton High Schools’ Touring Choir set was well rehearsed, with the stand-out performance of an original arrangement by one of their own students of Coldplay’s Midnight. There was a wave of resounding clapping the Women With Latitude bounced on stage bringing their joy and absolute delight in community singing. This 30-strong a Cappella voice ensemble are joyous and fun, and we almost want to sing along to Mr Sandman (The Chordettes) and Bohemian Rhapsody (Queen). Dressed in black and individually accessorised with flashes of red in their jewellery, scarves or shoes, they enjoy their womanliness. 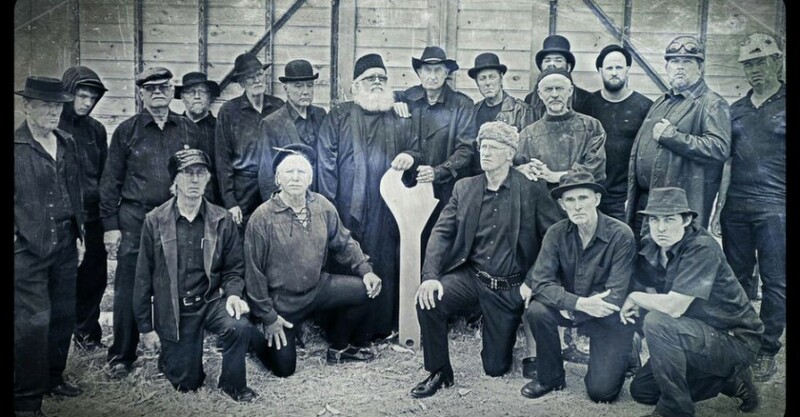 The sassiness of the women is then counterpointed by the arrival of the Spooky Men Of The West as they saunter slowly on to the stage in their dark outfits, various hats and beards. ; this bunch of blokes revel in their masculinity. Though not a Men’s group, they make sure we know they are men, that they are there and we notice them - ‘Yes’ - we see, hear and smell you! Ahhhmen. They love to sing about concrete, practice mysterious handshakes and are masters at ‘mastodontotry’ and ‘manhommery’. The lyrics are ironic (Don’t stand between a man and his tool), and accompanied by some very well executed comic theatre. Mostly originals, they do the occasional cover (Teddy Bears Picnic) but of course have to have a Spooky Men of The West twist! Thoroughly entertaining, this show is a winner. Karen Bailey & Brendan De Michele Spooky Men Of The West And Women With Latitude continues at various venues until Sun Mar 1. Book at FringeTIX on 1300 621 255 or adelaidefringe.com.au/fringetix. Click HERE to purchase your tickets. Four choral groups performed a feast for the eyes and ears!